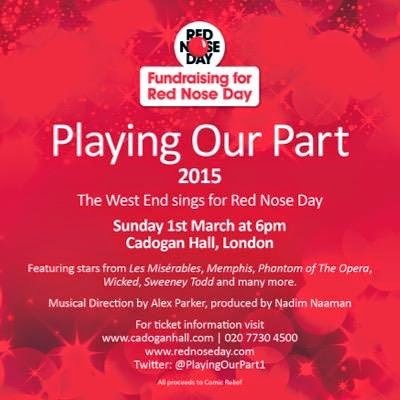 At Playing our Part this year the West End Sings for Comic Reflief Red Nose Day at the Cadogan Hall on 1st March at 6:00 pm. The line up will include stars from West End shows including The Phantom of the Opera, Sweeney Todd, Memphis and Wicked! and will feature pefomers including Gina Beck, Wendy Ferguson, Steph ParryLaura Pitt-Pulford, Laura Tebbutt, Simon Bailey, Killian Donnelly, Chris Howell, Adam Linstead, Nadim Naaman and Jeremy Secomb.